Typical applications of wire duct used in electrical control cabinet (above) and to contain power and networking cables in one of Omega’s training centers. WD Series wiring duct is the premium wire management product for routing and organizing wiring in control panels. 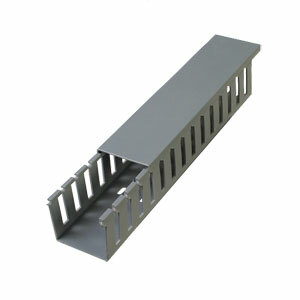 Wire duct is one of the cable management products developed specifically for use within cabinets and control panels. These wiring ducts come in a variety of sizes and colors to meet the specific needs of the largest integrated turnkey systems, to the small control panel projects. Colors: Grey, White, Blue or Black is available in single pieces. For colors please call to place you order. 참고: Note: S Standard slot width, T Thin slot width. White, Blue & Black can be ordered, Call 1-888-556-6342 to order colors.